If you&apos;ve ventured into Downtown Danville recently, you may have noticed that the Courthouse Square looks a little bit different. Fall is in full swing, and one of the best local fall traditions is on display for the month -- the annual Scarecrow Display. I took my sons downtown this week to check out this year&apos;s displays, and they do not disappoint. 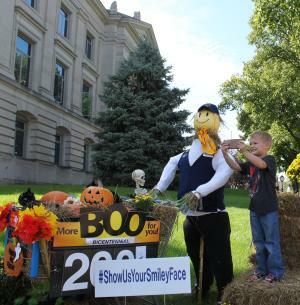 From traditional to silly, each local business or organization has invested lots of time into creating a fun fall display that adds life to the community. My 7-year-old&apos;s favorite display was an easy choice: the Pokemon display from Wright Realtors. My boys love playing Pokemon Go, so it&apos;s no surprise that this one was a big hit. We even caught a few Pokemon while we were downtown! My 5-year-old enjoyed the display from Walmart the most. He told me he liked it because it made him think of Halloween, but I personally think he enjoyed the fact that it&apos;s a great setup for a fall selfie. He took several! I loved all of the displays, but I think my favorite would have to be the display done by the Hendricks County Historical Museum. Of all the displays, I felt it captured the feeling of our local history and community. It was a hard choice, though; every display we saw was incredibly well done. 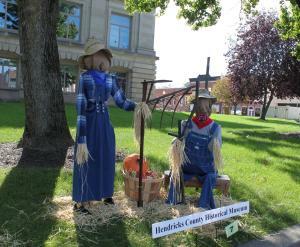 The scarecrows will remain up at the Downtown Danville Courthouse Square for the entire month of October. Be sure to check them out, and don&apos;t forget to bring your camera along! Afterward, I highly recommend enjoying a treat at one of the many great local eateries nearby. We had a brownie at The Beehive, and it was fantastic! Just make sure you don&apos;t miss this fun fall tradition.